OMG my sister had these, total flash back moment. Ha this sure did bring back memories! I never had one myself but I remember them being popular. Rugby shirts were so in then! Rugby shirts!!! I had a lot of them. Maui & Sons, T&C Surf, the whole 9. Tattered bleached jeanshorts and all. My middle son needed all the names. Saved his money in order to have them. My sister had this shirt! And we both wore 'Colors.' How freaking cute is this blog! Instant follower. Love the profile pic. I especially remember the Benetton magazine and TV ads. Thank you for visiting my blog. It is very nice to meet you!! I was never so cool. But I did have an alligator shirt. Come to think of it, it may've been a fake alligator shirt. 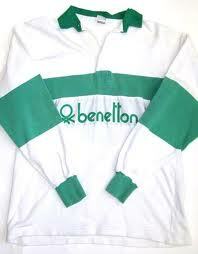 That benetton shirt is pretty darn cool, though. My sister used to love those shirts! I did! The blue and white one. Which was even cooler because it was a "soccer shirt" from my aunt's Italian ex-boyfriend. Benetton had the most annoying ads ever. Benetton was really hip back in the day. If you had one you were "wealthy" and really cool to be with. Which is probably why my Reeboks and target t-shirts never worked out for me. We were a backwoods community...we were lucky to have clothes. Nobody had this shirt. You know - I remember when these were cool... but I don't know anyone who had them. I saw them all the time. They were nice looking and certainly were a sign of the times. Glad to hear that you had one and enjoyed it so much!